A Pure White Smile Is Just 40 Minutes Away! Enhance your smile today with in-office teeth whitening. The leading professional teeth whitening brands take at least 90 minutes to whiten teeth. 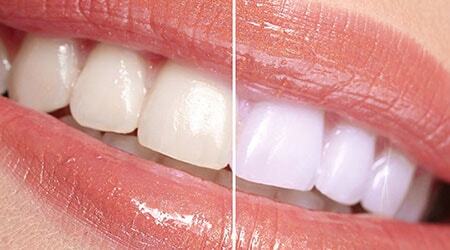 In-office teeth whitening gives you a brilliantly white smile in only 40 minutes! With In-office teeth whitening’s fast, effective technology, your teeth will be whiter and brighter in just one appointment. The dehydration of your teeth during typical whitening treatments can lead to severe sensitivity and tingling “zings” of pain! In-office teeth whitening contains PF (potassium nitrate and fluoride), which has shown to reduce sensitivity AND strengthen your enamel. Not only will you have a beautiful, whiter smile, but you’re improving the health of your teeth. A whiter smile can lead to a more youthful and confident you. With in-office-teeth whitening, a hot, uncomfortable light is not required to brighten your smile, making it more comfortable and effective to see the results – in just 40 minutes. Instead, your dentist will activate the whitening agent just before applying the treatment, giving you fresh and effective results.